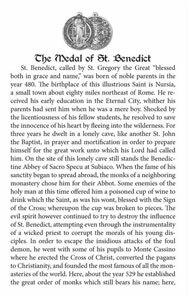 The medal of St. Benedict is a very powerful sacramental. Used to ward off the devil, obtain healing, help with childbirth, and clear the mind for studies, this richly indulgenced medal should be worn with faith and devotion by all Catholics. This leaflet outlines the history of this devotion, and some of the many indulgences that can be obtained by devotees.